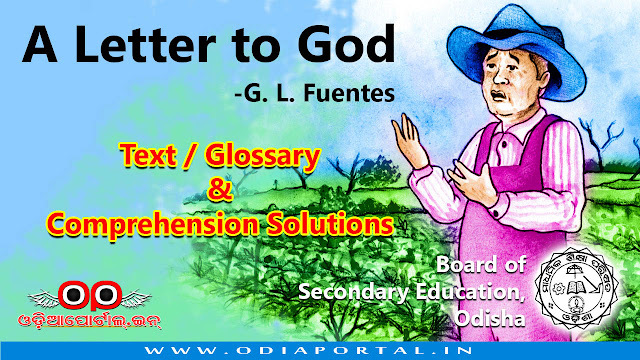 "A Letter To God" is the 1st chapter of English Text Book of Class X of Odisha School Students by Board of secondary education, Odisha. This text was written by Gregorio Lopez Fuentes. The following is the complete text along with Comprehension Solutions For Upcoming HSE Exam. Have you ever written a letter to God ? Did you ever come across someone writing a letter to God ? People believe faith can move mountains. But what should we put our faith in ? This is the question this story delicately poses. Lencho is a farmer who writes a letter to God asking for a sum of money when his crops fail. Does Lencho’s letter reach God ? Does God send him the money ? Think and try to answer these questions. Before you begin to read the story, try to imagine how it would develop and what conclusion it might arrive at. The house - the only one in the entire valley sat on the crest of a low hill. From this height one would see the river and the field of ripe corn dotted with the flowers that always promised a good harvest. The only thing the earth needed was a downpour or at least a shower. Throughout the morning Lencho–who knew his fields intimately had done nothing else but see the sky towards the north-east. With a satisfied expression he regarded the field of ripe corn with its flowers, draped in a curtain of rain. But suddenly a strong wind began to blow and along with the rain very large hailstones began to fall. These truly did resemble new silver coins. The boys, exposing themselves to the rain, ran out to collect the frozen pearls. “It’s really getting bad now”, exclaimed the man. “I hope it passes quickly.” It did not pass quickly. For an hour the hail rained on the house, the garden, the hillside, the cornfield, on the whole valley. The field was white, as if covered with salt. That night was a sorrowful one. But in the hearts of all who lived in that solitary house in the middle of the valley, there was a single hope: help from God. All through the night, Lencho thought only of one hope: the help of God, whose eyes, as he had been instructed, see everything, even what is deep in one’s conscience. Lencho was an ox of a man, working like an animal in the fields, but still he knew how to write. The following Sunday, at daybreak, he began to write a letter which he himself would carry to town and place in the mail. It was nothing less than a letter to God. He wrote ‘To God’ on the envelope, put the letter inside and, still troubled, went to town. At the post office, he placed a stamp on the letter and dropped it into the mailbox. So, in order not to shake the writer’s faith in God, the postmaster came up with an idea: answer the letter. But when he opened it, it was evident that to answer it he needed something more than goodwill, ink and paper. But he stuck to his resolution: he asked for money from his employees, he himself gave part of his salary, and several friends of his were obliged to give something ‘for an act of charity’. It was impossible for him to gather together the hundred pesos, so he was able to send the farmer only a little more than half. He put the money in an envelope addressed to Lencho and with it a letter containing only a single word as a signature : God. The following Sunday Lencho came a bit earlier than usual to ask if there was a letter for him. It was the postman himself who handed the letter to him while the postmaster, experiencing the contentment of a man who has performed a good deed, looked on from his office. Lencho showed not the slightest surprise on seeing the money; such was his confidence- but he became angry when he counted the money. God could not have made a mistake, nor could he have denied Lencho what he had requested. Gregorio Lopez Fuentes (1895-1966) was a Mexican novelist, poet, and journalist. Fuentes started writing at the age of 15, when the Mexican Revolution began. Many of his books are related to the civil conflict. His stories are exciting and humorous. Many of his works are concerned with the oppression of Americans. He was awarded the National Prize of Arts and Science in 1935. 1. Where was Lencho's house ? What were the surroundings ? Or, What did he grow and what did he need most ? ANS. Lencho was a farmer. His house was the only of its kind in the entire valley. The house sat on the top of a low hill. From the height of the house one would see the river and the field of ripe corn dotted with flowers. The growing corn with flowers promised Lencho a good harvest. But he needed a downpour or at least a shower for the corn. So throughout the morning, Lencho did nothing but look at the sky towards the north-east expecting good rain. 2. What did Lencho say about the raindrops ? Ans. The drops of rain gripped Lencho's mind. On returning home, he exclaimed that the-raindrops were truly new coins. The .big drops were ten cent pieces and the little ones were five. As raindrops would have helped in getting a better harvest, resulting in more prosperity, so Lencho compared them with new coins. 3. What did Lencho regard the field of ripe corn with flowers ? What happened suddenly ? How did Lencho's son react ? Or, What were the frozen pearls ? Who ran out to collect them ? Ans. Lencho was all excited about the big and small raindrops. He took them for new coins. With a satisfied (happy) expression, he regarded the field of ripe com with flowers covered in a.curtain of rain. But suddenly a strong wind began to blow. It carried very huge (big) hailstones. These truly appeared as new silver coins. Lencho's sons got exposed (came out) to the rain. They ran out to collect the hailstones resembling (looking alike) frozen pearls. 4. Why was Lencho's soul filled with sadness ? Or, On what things did very large hailstones rain (fall) ? Ans. The rain was soon followed by a sudden strong wind. Along with the rain very large hailstones began to fall. These hailstones looked exactly like new silver coins. Lencho hoped the hailstorm to pass quickly. For an hour the hail rained on the house, the garden, the hillside, the corn field, on the whole valley. The corn field was white.as if covered with salt. Not a leaf remained on the trees. The com along with the flowers was totally destroyed. So Lencho's soul was filled with sadness. 5. What were Lencho's feelings when the hail stopped ? Who did he have faith in ? What did he do ? Ans. After the destruction caused by hail, Lencho was shattered. He could see a bleak future for him and his family. He was worried about lack of food for the coming year. Lencho had faith in God. He believed that God could see everything and would help him out. Lencho wrote a letter to the God, explained his situation and asked for some money from God. 6. What was Lencho's only hope ? What did he do to keep this hope alive ? What hope did Lencho think of throughout the night ? How did he try to keep up the hope ? Ans. Lencho 's dream of reaping a good harvest broke. His corn field with flowers was totally destroyed. Yet he didn't give up hope. He only knew that in God's world no one died of hunger. All through the night, Lencho thought only of one hope. It was the help of God. Though he was as hardworking.as an ox, he knew how to write. The following Sunday, at daybreak, he began to write a letter addressed to God. He himself carried this letter to town and placed it in the mail. 7. Whom did Lencho address in his first letter and what did he request in it ? 8. How did the postman and the postmaster express their feeling when they came upon Lencho's letter ? Ans. A postman, one of the employees, came by Lencho's letter. He went to his boss laughing heartily and showed him the letter to God. Never in his career as a postman had he known that address. The postmaster was a fat and friendly person. He also broke out laughing. But almost immediately he turned serious. Tapping the letter on his desk, he admired the faith of Lencho who had written the letter to communicate with God. 9. What did the postmaster do not to shake Lencho's faith in God ? Ans. The postmaster, in order not to shake Lencho's faith in God, came up with an idea to answer the letter. When he read the letter, he immediately promised to send some money to the man. He stuck (kept firmly) to his resolution (promise). He asked for money from his employees. He himself gave a.part of his salary. Even several friends of his parted away some money "for an act of charity". 10. Why did .the postmaster send money to Lencho ? Why did he sign the letter 'God' ? Ans. Postmaster was moved by Lencho's complete faith in God. So, he decided to send money to Lencho. Moreover, the postmaster did not want to shake Lencho's faith in God. So, he signed the letter "God'. It was a good ploy to convey a message that God had himself written the letter. 11. How did the postmaster reply to Lencho 's letter ? Or, How much money did the postmaster collect for Lencho and how did he send it to him ? Ans. The postmaster, to stick to his resolution, gathered the money. Not only he himself but some employees and several of his friends gave part of their money. He. was able to send the farmer only a little more than half. He put the collected seventy pesos in an envelope, addressed to Lencho with a letter. This letter contained only a single word as a signature "God." This is how the postmaster replied to Lencho's letter of request. 12. Why did Lencho become angry when he counted the money ? Ans. The following Sunday Lencho came a bit earlier than usual to ask if there was a letter for him. The postman himself handed the letter to him. The postmaster was found experiencing the inner happiness of Lencho. Lencho showed not even least surprise on seeing the money. But he became angry when he counted the money. He was pretty sure that God couldn't have made a mistake. So he was obliged to write and send his next letter to God with the hope of getting back the rest thirty pesos. 13. What did the postmaster read on opening Lencho 's second letter ? Ans. Lencho became angry when he counted the money. So he wept up to the window to ask for paper and ink. When he finished writing the letter, he affixed a stamp to the envelope with a blow of his fist. The moment the letter fell into the mailbox, the postmaster went to open it. In this letter Lencho had requested God to send the next thirty pesos since he needed· it most. But his request was not to send the money through the mail because the post office employees were a bunch of crooks.